When operating within the linear region of a component, gain through that component is constant for a given frequency. As the input signal is increased in power, a point is reached where the power of the signal at the output is not amplified by the same amount as the smaller signal. At the point where the input signal is amplified by an amount 1 dB less than the small signal gain, the 1 dB Compression Point has been reached. A rapid decrease in gain will be experienced after the 1 dB compression point is reached. If the input power is increased to an extreme value, the component will be destroyed. Passive, nonlinear components such as diodes also exhibit 1 dB compression points. Indeed, it is the nonlinear active transistors that cause the 1 dB compression point to exist in amplifiers. Of course, a power level can be reached in any device that will eventually destroy it. A common rule of thumb for the relationship between the 3rd-order intercept point (IP3) and the 1 dB compression point (P1dB) is 10 to 12 dB. Many software packages allow the user to enter a fixed level for the P1dB to be below the IP3. For instance, if a fixed level of 12 dB below IP3 is used and the IP3 for the device is +30 dBm, then the P1dB would be +18 dBm. In order to test the theory, IP3 and P1dB values from 53 randomly chosen amplifiers and mixers were entered into an Excel spreadsheet (see table below and resulting graph to the right). The parts represent a cross-section of silicon and GaAs, FETs, BJTs, and diodes, connectorized and surface mount devices. A mean average and standard deviation was calculated for the sample. As it turns out, the mean is 11.7 dB with a standard deviation of 2.9 dB, so about 68% of the sample has P1dB values that fall between 8.8 dB and 14.6 dB below the IP3 values. What that means is that the long-lived rule of thumb is a pretty good one. A more useful exercise might be to separate the samples into silicon and GaAs to obtain unique (or maybe not) means and standard deviations for each. An interesting sidebar is that where available, the IP2 values were also noted. 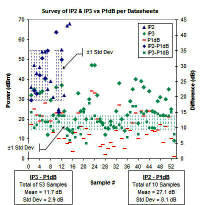 As can be seen in the chart, the relationship between IP2 and P1dB is not nearly as consistent. Of equal motivation for the investigation was the desire to confirm or discredit the use of the noise figure and IP3 type of cascade formula for use in cascading component P1dB values. As discussed elsewhere, the equation for tracking a component from its linear operating region into its nonlinear region is highly dependent on the entire circuit structure, and one model is not sufficient to cover all instances. Indeed, the more sophisticated (pronounced “very expensive”) system simulators provide the ability to describe a polynomial equation that fits the curve of the measured device. Carrying the calculation through many stages is calculation intensive. Some simulators exploit the rule of thumb of IP3 versus P1dB tracking and simply apply the IP3 cascade equation to P1dB. As with other shortcuts, as long as the user is aware of the approximation and can live with it, it’s a beautiful thing. Calculating the cascaded values for 1 dB compression point (P1dB) for the system budget requires use of ratios for gain and power levels for P1dB (do not use dB and dBm values, respectively). The standard format for indicating decibel values is to use upper case letters; i.e., P1dB for units of dBm. The standard format for indicating power values is to use lower case letters; i.e., p1db for units of mW. Cascading of 1 dB Compression points is not a straightforward process, since the curve followed from linear operation into saturation is dependent upon the circuit characteristics. A precise calculation requires knowing the equation of the input/output power transfer curve of each device, which is typically a high-order polynomial that would be very difficult both to ascertain and also to apply mathematically. 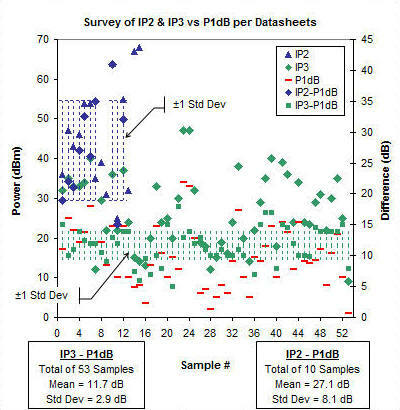 A well-known rule-of-thumb is to subtract 10 to 15 dB to the IP3 value to estimate the P1dB value. To test that theory, I looked at the published values of IP3 and P1dB for some common devices and calculated the difference between IP3 and P1dB (see table below). A sample of 53 devices resulted in a mean difference of 11.7 dB, with a standard deviation of 2.9 dB. That is pretty good agreement with the rule-of-thumb. Accordingly, a reasonable estimate of the cascaded P1dB value is to either apply the cascaded IP3 equation directly to each device's P1dB value, or to simply calculate the actual cascaded IP3 and subtract 10 to 15 dB to the result and declare that to be the cascaded P1dB. Note that this estimate only holds when none of the stages in the cascade are normally operating outside of the linear region. This equation gives the method for calculating cascaded output p1db (op1db) values based on the equation for oip3 and gain of each stage. When using the formula in a software program or in a spreadsheet, it is more convenient and efficient to calculate each successive cascaded stage with the one preceding it using the following format, per the drawing (above-right). The following table of values was used to create the chart shown near the top of the page.